The middle ground for human rights work throughout India is eroding fast. Social activists, civil society leaders and “right to information” activists—who have always stood against the exploitation of Dalits, tribes and other marginalised communities—are increasingly facing the wrath of the state, despite it being the largest democracy in the world. Instead of treating these activists as partners in a very vibrant democratic process, the state more often perceives them as threats to “national security” and “national interests”. As a result, the state is increasingly targeting, harassing, imprisoning—and sometimes even killing—many of these defenders. The situation is even worse in the conflict zones of central and northeast India, as well as in Kashmir, where anyone critical of the state is immediately subject to suspicion, intimidation, harassment, torture and death. The most common tactic that the state uses to threaten and silence human rights defenders is arrests in false and fabricated cases. It is against this backdrop that Human Rights Defenders Alert – India (HRDA) intervened in 104 cases of human rights defenders with the National Human Rights Commission of India (NHRC) and various United Nations (UN) human rights mechanisms in 2015. During the same year, HRDA intervened in 11 cases of murder, 60 cases of harassment, physical assault, physical and verbal threat, and 33 cases of arbitrary arrest and detention. Nearly 80% of these cases were of human rights defenders working on protecting land, natural resources, tribal rights and exposing corruption. Twenty-four cases were those who used Right to Information (RTI) applications and 11 cases were reprisals against journalists, writers and socio-political thinkers. In seven cases, peacefully protesting citizens faced severe crackdowns and excessive use of force by state officials. The most common tactic that the state uses to threaten and silence human rights defenders is arrests in false and fabricated cases. In the first quarter of 2016, HRDA has intervened in more than 60 cases. This period has witnessed systematic attacks on journalists, lawyers, researchers and activists in the state of Chhattisgarh. In other parts of India, crackdowns on student movements are becoming common, including charging them under fabricated cases. HRDA was initially conceived as a national desk on human rights defenders, which matured to become a national network of human rights defenders with a membership of more than 1,000 individuals and organisations. HRDA is a network of concerned citizens, acting as volunteer human rights defenders, who are willing to stand up for human rights in the country, while focusing on strengthening and protecting human rights defenders. People’s Watch, a national organisation with headquarters in Madurai, initiated HRDA in 2009 based on engagements with human rights defenders in 18 states. People’s Watch itself faced reprisals from the government when its Foreign Contribution Regulation Act (FCRA) license was wrongly suspended for 540 days in 2012-2014. It needed an order of the Delhi High Court to restore the license. HRDA has five regional desks run primarily by volunteers and part-time workers, functioning from New Delhi, Pune, Bhubaneshwar, Bangalore and Guwahati. Volunteerism in HRDA strengthens the solidarity among human rights defenders, building a network that is engaging in human rights protection as a political choice rather than a career path. Each desk identifies and fact-checks cases of attacks, threats, detention and disappearances of human rights defenders in their regions. The desks then send urgent appeals for action to the NHRC, concerned police and administrative authorities at the state level and in severe cases, to the concerned UN Special Rapporteurs and specialised international organisations working for human rights defenders. The goal is to create a nationwide network of human rights defenders reaching to every corner of the country, so that monitoring of human rights defenders’ cases becomes accessible and human rights defenders can connect to each other in solidarity and support. 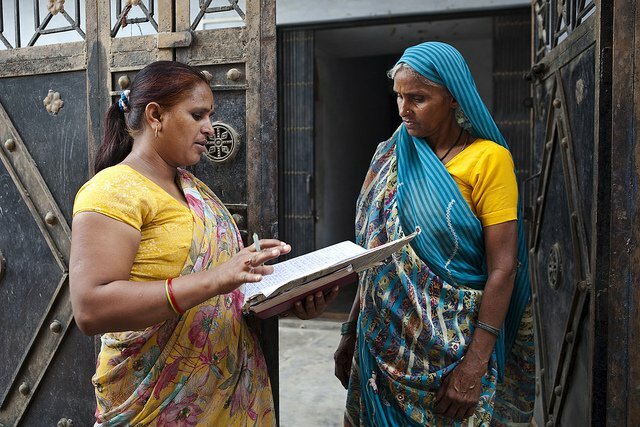 A human rights defender informs a widow on her right to receive a pension. HRDA also conducts periodic regional and state level trainings for human rights defenders, to create awareness and knowledge with regard to available national and international protection mechanisms. HRDA identifies human rights defenders from each district in a state and train them to document and disseminate information about human rights defenders in distress. This enables grassroots human rights defenders working to connect and communicate issues to a larger audience which otherwise find no or very limited space in media. HRDA also initiates fact-finding missions and trial observations in selected cases. Based on a needs assessment, HRDA facilitates pro bono legal, medical and relocation assistance to the defenders. Interventions by HRDA, with the NHRC and UN Special Rapporteurs, have made significant inroads in certain cases. However, the majority of the cases with the NHRC continue to be pending given the bureaucratic nature of the institution. Recently, based on HRDA’s interventions, NHRC has ordered an independent investigation into the systematic attacks on human rights defenders in the state of Chhattisgarh. In many instances, communication by NHRC alarms the state and can provide immediate relief to human rights defenders—such as releasing them from custody or moving them to a safer location. But the NHRC still has a long way to go to shed its image of just another toothless government body. Given the severe shrinking of democratic space in India, HRDA, along with several other organisations, is conceptualising a people’s commission that will attend to the issues of attacks on human rights defenders, freedoms of expression, association, assembly, protest and dissent, through a people’s tribunal. We will finalize and publicize the procedures and structure of this commission during the first national convention later this month. For HRDA, using the national and state human rights institutions strategically means recognising their powers and roles, despite the fact that they are politically influenced by the government. A collective effort, keeping aside all differences, is critical for human rights defenders. Initiatives like HRDA can only be successful when they are led by human rights defenders themselves and not by one organisation or group.